Kill the outlaw Rels Tenim near Vos. Speak to Hrundi in the Wolverine Hall Fighter's Guild for your orders. Take a boat to Vos. Head north to the Ahemmusa Camp. Hrundi in the Wolverine Hall Fighter's Guild asks you fulfill the bounty on an outlaw Rels Tenim near Vos (given at the same time as the Berwen's Stalker quest). Speak with just about anyone in Vos, which is west of Tel Mora, to find out that the Ahemmusa Tribe might know where he is hiding. The Ahemmusa Camp is directly north of Vos (you visit it during the Main Quest and it might be marked on your map). Speak with anyone in the camp (you may need to persuade them first) to find that Tenim may be in Shallit, on a small island southwest of Ald Daedroth. Shallit can be tedious to find if you head across the sea from the Ahemmusa, but it is northwest of the camp, on the north side of the small island that is just before you reach the larger island on which are Dagon Fel and multiple ruins (Rotheran, Nchardahrk, Mzuleft).The directions you are given by the Ahemmusa are vague and a bit misleading. The hideout is actually quite a ways west-southwest of Ald Daedroth, and is closer to Dagon Fel, both as the crow flies and in travel time. Thus, you can spend a few coins and save time by taking a ship to Dagon Fel, then going south-southeast to find Shallit's island; this involves only one short bit of manually crossing water between the two islands. "The unwary will find themselves in the clutches of a black fate." If you run through Shallit quickly, you'll find that Tenim is nowhere to be found, and that the final door in the cave leads into Drethan Ancestral Tomb, inhabited by a spell-casting Vampire – a trap that has been laid for you and any other bounty hunters. In the cavern just after you enter the cave, look up and to the south, and you'll see a hidden ledge (you might notice it on your map as well). You'll need Levitate or strong Jump to get up there, and you should be able to find a potion or two lying around in the lower cave if you don't have the Levitate ability handy. Once up, you'll quickly encounter four of Tenim's generic bandit friends before you meet the well-equipped Tenim himself. There's a good amount of loot to be picked up here (gems mostly) so look around. Return to Hrundi for your 200 gold reward. 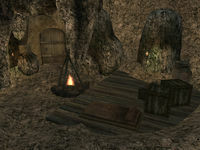 You can find a very valuable ring, Marara's Ring, on the Vampire Marara in the Drethan Ancestral Tomb accessed via a back door in Shallit, or its own front door elsewhere on the small island. Quest stage 40 can never be accessed except by using the console, even if you are actually told that the Ahemmusa might know where Tenim is hiding. Speaking to Sinnammu Mirpal, the Wise Woman of the Ahemmusa Tribe, about Rels Tenim will open the dialog option "cross the water", which will in turn open "accompany you" and allow you to get Mirpal to follow you, expecting to get to Ald Daedroth. If you allow her to follow you, she can be killed, thus possibly disrupting your current status in the Main Quest. 10 Hrundi mentioned that he had a contract for the outlaw Rels Tenim. If I find Rels Tenim who was last seen in Vos, and bring him to justice, there is a reward of 200 gold. 40 I was told that Rels Tenim left for an outlaw hideout to the north. I was told that the Ahemmusa might know where he is hiding. 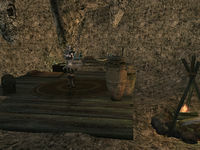 60 I was told that Rels Tenim is in the outlaw hideout Shallit which is on a small island southwest of Ald Daedroth. To get there, I should travel northwest from the Ahemmusa Camp. If I come to an old Dwemer ruin, I have traveled too far. 100 Finishes quest Hrundi thanked me for bringing Rels Tenim to justice and gave me 200 gold. This page was last modified on 22 June 2017, at 04:55.